This is a "peasant" dish and is one of our favorite simple meals. Bruschetta is the original garlic bread and is made by starting with great bread that is toasted or grilled, rubbed with fresh garlic and drizzled with good extra virgin olive oil. Trim & slice the stems of the greens thinly & the leaves coarsely. Heat the olive oil in a heavy skillet. Cook the onion over medium heat until it starts to soften. Add the stems, a little water and the Garli Garni. Cook briefly & then add the leaves. Cook, stirring until greens are wilted. Add the beans & a little more water as needed & cook until greens are tender. Season with fresh black pepper. Meanwhile, prepare the bruschetta. Place a slice on a plate and top with the greens, drizzle with olive oil and top with a splash of vinegar. 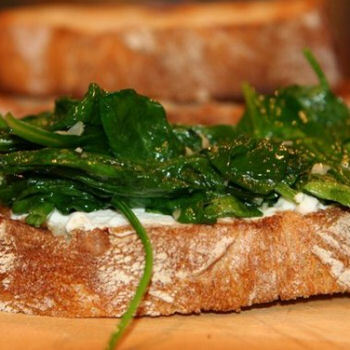 Options: Garnish with shaves of Parmesan or put a slice of mozzarella on bruschetta and broil before adding greens. Buon Appetito!